Short and sweet. 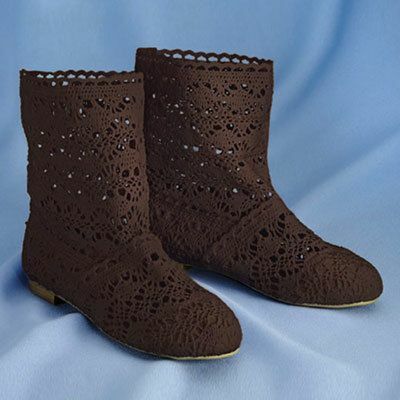 Slip-on ankle boots are crocheted in polyester with webbing-reinforced toe and heel to hold their shape; polyester pull tab at back for easy on-off; rubber sole for comfort. Imported. Whole sizes only. Hurry! Quantities are limited! These boots run quite large. I was told by The Paragon that all their shoes and boots run true to size. I wear a 7.5, so I was told to order an 8. Since for now I have to wear an "Ace" type bandage on one foot, I'm keeping them. If not for that, they would be much too big to wear. They look good, the crochet is pretty. The reinforced toe is very hard. Hopefully, that will soften up.